The Explorer 39 is exactly the Rolex I want. Me too. Amazing how the classic Rolex designs like the Explorer, Datejust, Day-Date just don't scale up very well (at least to me). Of course, I'm partial to the 36mm Explorer. My dad's been wearing a 14270 just about since it was released, 1990 or so. I also owned a 36mm Datejust which is one of the few watches I've sold as I couldn't swing the fluted bezel and jubilee bracelet. I loved looking at that watch in the case but I just couldn't bring myself to wear it. I constantly play with the idea of buying a domed bezel/oyster bracelet version of the same watch. YES YES YES YES AAAAAAAA-MEN!!!!!!!! THAT is the problem. It just doesn't work scaled up. At least to my eye. Perhaps had I never seen a 36mm version, I'd be fine with it. But I have. And so it looked like it got pumped up on roids. Or elephantitus. It just didn't work for me. and I tried. TWICE! 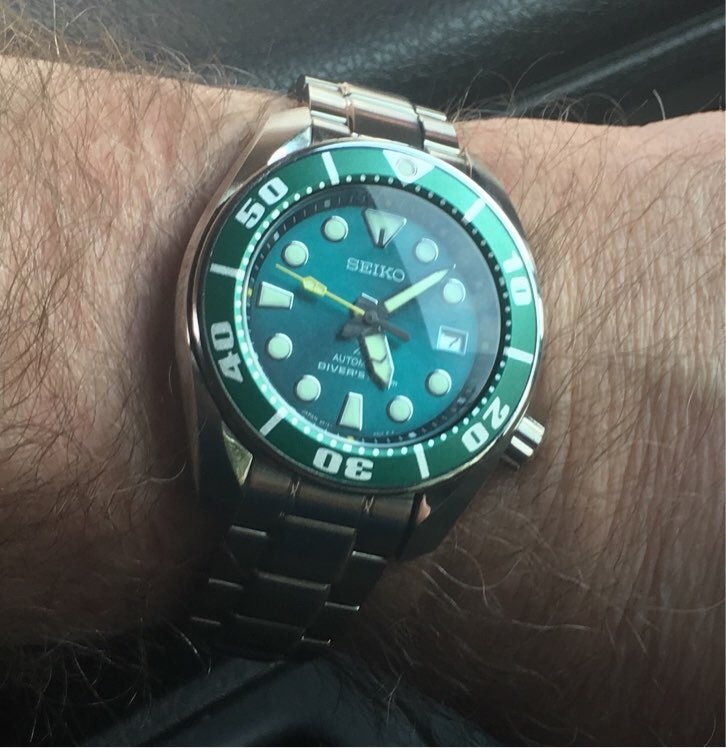 I’ve got a Seiko Sumo ‘Hulk’ coming my way from Japan. I’ve always been tempted by the blue Sumo but seeing the green hulk did me in. I’ll post a pic after I receive it. Me too . I can’t get imgur to work though. I think they’re calling this one the Jade Sumo, Emerald Sumo, or Grumo. In any case if you like green watches this one is pretty nice. My lousy photo doesn’t do it justice. I have an incoming. Been curious about this brand and it fills an open role for me. I'll add new pics after it arrives. I like the gold Turtle. Don’t think I could wear it, but I like it. This is a pretty good representation of the color, on my monitor, at least. What do you think? I am still tempted by black in this strap. I may darken it a bit - dyeing leather isn't too hard and I could make it a darker olive. I could even dye it all the way black if I want to. Or get this strap in black. Nothing special but I like it. That's really nice! Not too "busy". Any advice regarding chrono watches, particularly Citizen and Seiko? I have a pair of simple Citizen Ecos, and have found a few I like from both brands. Is either movement better when multiple movements come into play? Very nice — I like that one a lot! Is the face blue as it appears, or is that an AR coating hitting the light just right...? I don't think there is a lot of difference. I haven't heard complaints about either brand. A good looking strap. I'd go darker. Originally posted by at-home-daddy:...Is the face blue as it appears, or is that an AR coating hitting the light just right...? Since the upper lugs also look blue, I suspect it's a reflection of the environment. Thank you! 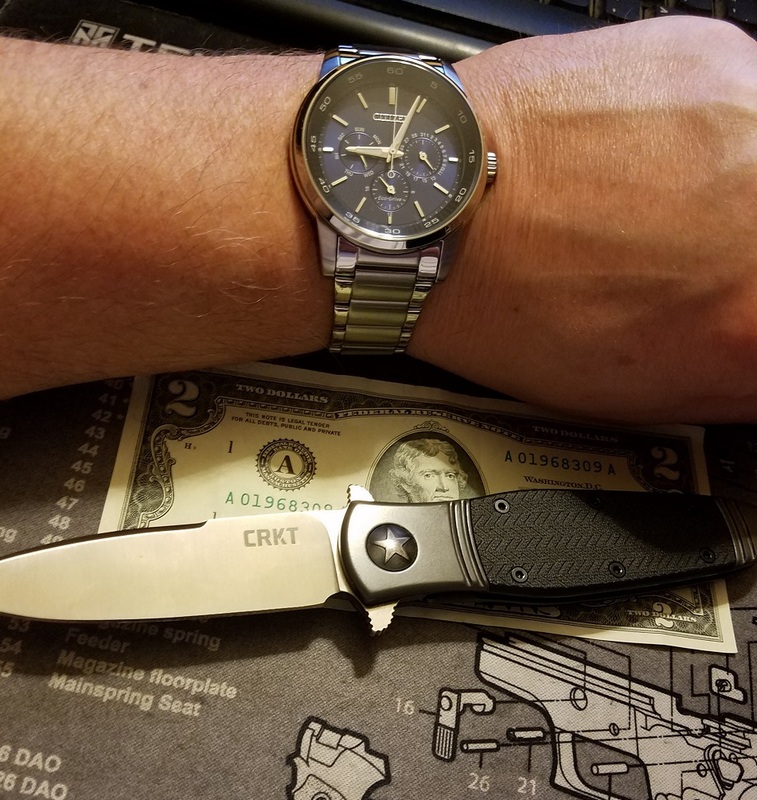 Just ordered a Seiko and already feel like I'm cheating on my Citizens. Can't wait to wear it, though!